Dwyane Wade is nearing the end of the final season of his legendary career, but he still has plenty of game left in the tank. Wade banked a three-point buzzer beater on Wednesday night against the Warriors. He also scored 25 points and helped Miami snap a six-game home losing streak. Wade took a victory lap, waving a towel as the fans roared. “It’s special for me,” he told reporters. “Obviously, as a team, we needed this win bad, but we kept fighting, everybody. “I’ve been in this position so many times. And so many times, you don’t make the shot. The one I make is a one-legged flick from my chest — it’s crazy. But it’s great to do it in front of the fans. “This is a fun moment. I told Steph I needed this one on my way out. You all get enough, you got enough. Some of the Warriors watched the replay on the overhead screens with a look of disbelief, and after a moment Stephen Curry came over to offer congratulations after presumably their last head-to-head meeting before Wade retires after this season. He acknowledged that he could not help but appreciate Wade’s effort, even as it cost the Warriors. “There are just a lot of smiles — frustrated smiles from our standpoint,” he said. “But it was something special, him making a play like that in his last year in this building. “I’d much rather see him jumping on the scorer’s table when we’re not on the court with him, but those are iconic moments that he’s had. 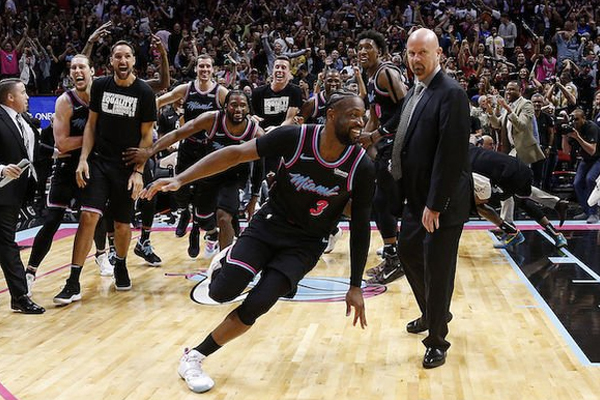 This is Wade’s farewell season, and there will be few, if any, better moments than this one.